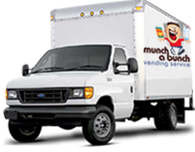 Munch A Bunch Vending has been serving San Diego since 1987. This is not some company formed by acquisition, but instead from the ground up through the hard work of its founders. Locally owned and operated, our goal is provide the widest selection of brand-name products, with the best service, while also being affordable. Furthermore, we’re an active member of the National Automated Merchandising Association (NAMA), another example of our commitment to the industry. Beyond our people, we insist on utilizing the best technologies in the business, and we customize product selection and vending agreements to fit you best. We regularly clean and maintain machines, and any service requests are met with rapid response. Our efforts aren’t just lip service…they’ve been nationally recognized. In fact, just last year, our long-time route driver, Greg Winans, was the quarterly recipient of the “Route Driver of the Year” Award by Automatic Merchandiser magazine. 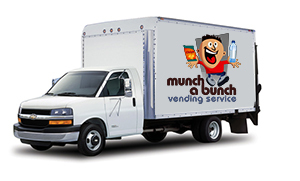 He’s a great asset to our company, and an example of the type of people you’ll find at Munch A Bunch.